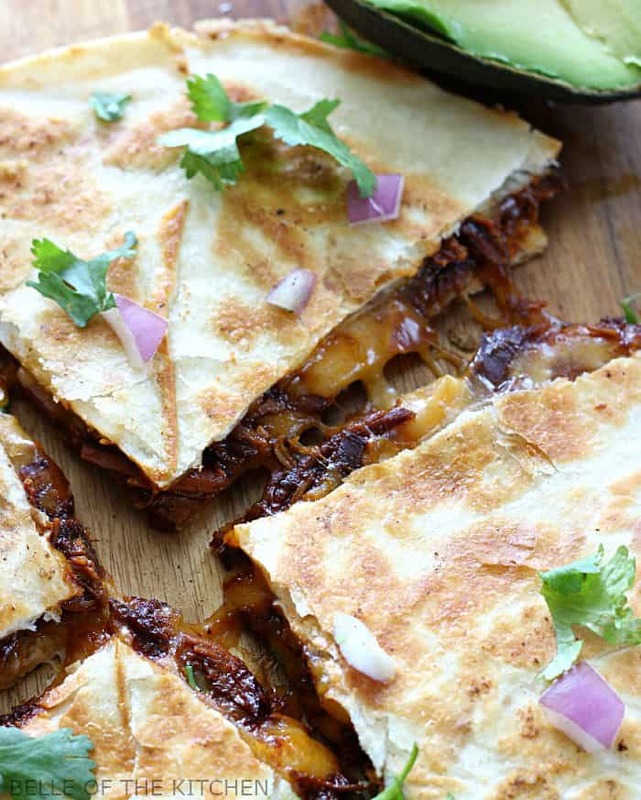 Slow Cooker BBQ Chicken Quesadillas – Juicy chicken cooks with a Smoky Bacon BBQ sauce in your slow cooker, then pairs with gooey cheese to make these yummy quesadillas. 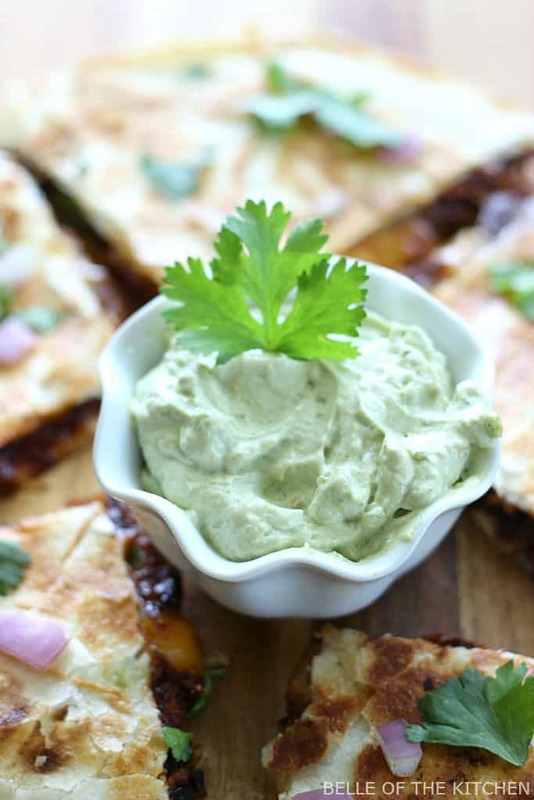 Top with cilantro and serve with a creamy Bacon Avocado Dip from Tastefully Simple for an easy dinner! I’m pretty sure at some point in time I’ve told y’all the story about my crazy pregnancy craving. It wasn’t pickles, or ice cream, although I did enjoy both of those very much while I was pregnant. Heck, I loved all food when I was pregnant, aside from coffee (who was I back then?!) and raw chicken. My one true love during those 9 months of pregnancy with my daughter was the glorious avocado. Everytime I went to the store, I bought one. When we would go out to eat, I prioritized all restaurants on their avocado availability. I’ll never forget the day that my hubby discovered an avocado tree near his work (a HUGE perk of Hawaii living) and surprised me by bringing home a whole armload. Talk about the way to a preggo’s heart! Now, the only thing I like better than a big ole chunk of avocado on my plate, is a tortilla stuffed with bbq chicken to go with it. It makes me think of BBQ Chicken Pizza and it just makes ya feel happy. In addition to having such yummy ingredients, these Bacon BBQ Chicken Quesadillas are crazy easy to make. First I cooked some chicken breasts in the slow cooker with a Smoky Bacon BBQ Sauce from Tastefully Simple. This is my new favorite BBQ sauce, by the way. The smell alone will make your stomach growl! After the chicken is cooked, just shred it all up, then add it to some tortillas with a heaping mound of cheese, some chopped red onion, and a little cilantro. Pan fry all that goodness up until it’s nice and crispy. Serve with some salsa, sliced avocado, and a little Bacon Avocado Dip, which is also from Tastefully Simple. Goodness, I’m getting hungry again. Slow Cooker BBQ Chicken Quesadillas – Juicy chicken cooks with a Smoky Bacon BBQ sauce in your slow cooker, then pairs with gooey cheese to make these yummy quesadillas. 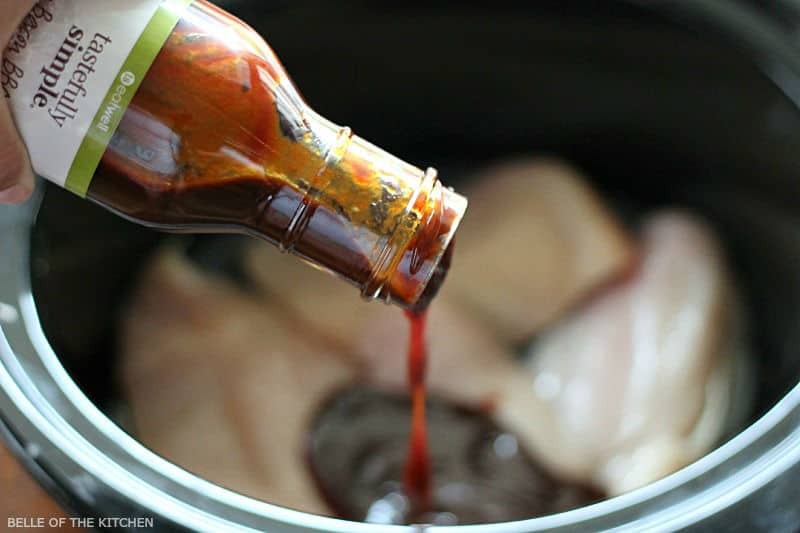 Combine chicken breasts and bbq sauce in the bowl of your slow cooker. Place lid on top and cook for 3-4 hours on high, or 5 hours on low (you don't want to overcook it, keep an eye on it if you can). Shred chicken with two forks once it is cooked through. 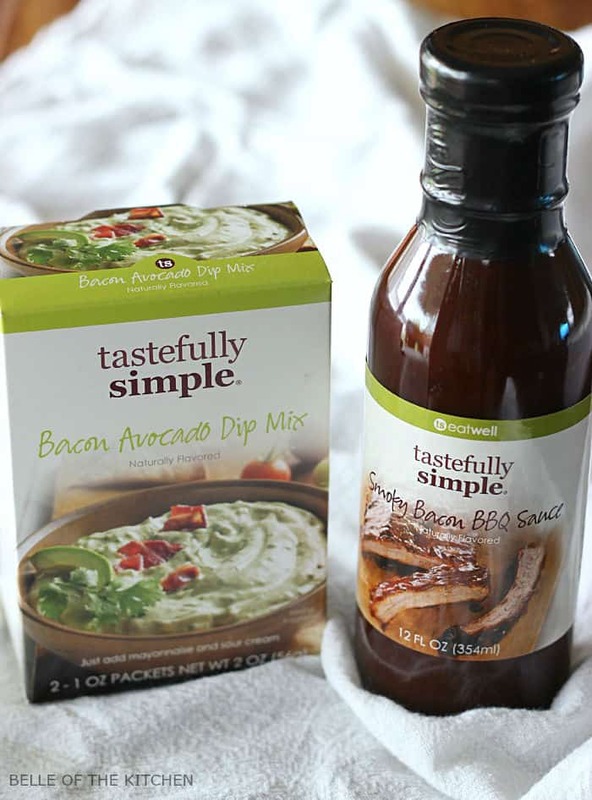 To make Bacon Avocado Dip Mix, combine mix packet with sour cream and mayonnaise in a medium sized bowl. Refrigerate until ready to use. In a large skillet, melt 1/2 TB butter over medium high heat. Add a tortilla to the pan, and top with a sprinkling of cheese (about 1/4 cup) followed by a scoop of bbq chicken. Spread out evenly, then top with a little diced onion and cilantro (about 1 heaping TB each) and another 1/4 cup of cheese. Top with second tortilla. When bottom tortilla is golden brown, carefully lift quesadilla with a spatula and add another 1/2 TB butter to the pan. All to melt then flip quesadilla over and cook the other side. Repeat steps 3-4 to make remaining quesadillas. Serve with salsa, remaining cilantro, and Bacon Avocado Dip. Enjoy! Yay Sophie!!! Glad you enjoyed it! We’re obsessed with quesadillas! These look so easy and awesome! And that bacon avocado dip is calling my name! These were amazing, Maegan! I bet y’all would love them, for sure! Oh my goodness do these look so good or what!! Love that they are slow cooker style too! Plus I love your sweet profile pic now too! Thanks Michelle! And yes, avocados are the bomb! YES! Avocado trees are everywhere!! There are actually quite a few in our neighborhood that I’ve found! Ohhh this looks so delicious! I LOVE avocado too! When I discovered avocado toast it was basically the only thing I ate for a whole week! haha! I can’t wait to try this! This is the perfect summer slow cooker recipe! 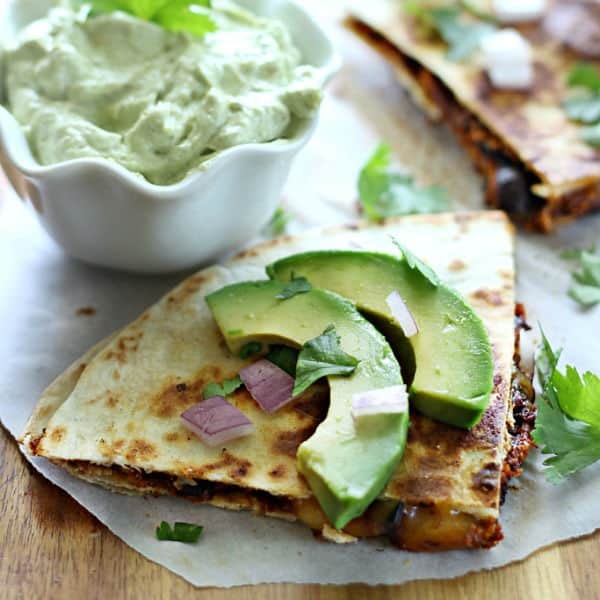 We LOVE our quesadillas around here! Hey! 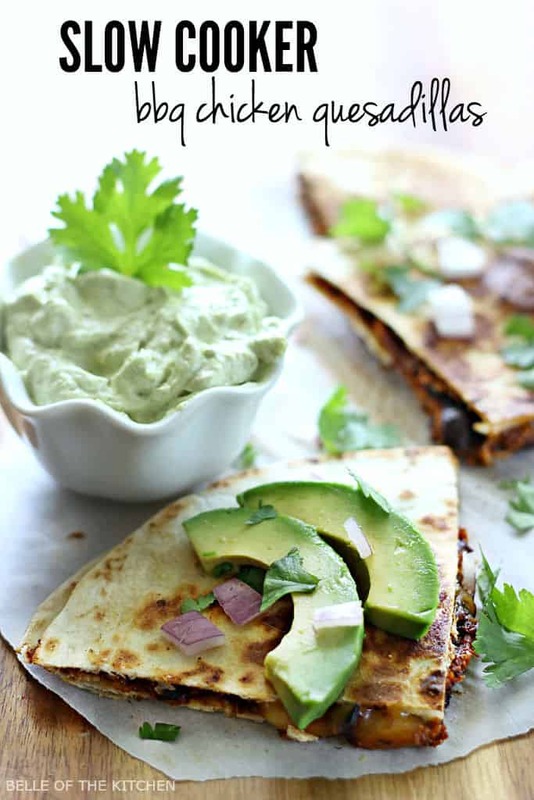 Craving avocado is a good thing, you were providing great nutrition to your daughter 🙂 These quesadillas look awesome!